Please note that these instructions are designed for the Windows version of the software; for Mac setup, see this guide. The first step is to purchase Bria from the developer, Counterpath. Note that you may need to create and log into a Counterpath account. If so, once logged into your account, you will need to use the Downloads link to obtain your software. Please choose the appropriate package for your operating system and download the software to your Desktop or other folder of your choosing.Purchase Bria (opens in new window)Now open the software package you’ve downloaded, and proceed through the installation steps. Once you have finished installing the software, open Bria to begin configuring it for your Easy Office Phone account. Note that the program may require you to update certain other components; this should be done automatically after the program prompts you. Before proceeding, ensure you have your license key information ready. When logged into your Counterpath account, you can find this information under the License Manager. Then click Continue, and you should now see the screen below. Carefully copy and paste your license key, then click Done. Bria will take a moment to save your changes, and then present you with the main program screen. Here you’ll see the message Account is not enabled. Go to Account Settings. Click the Account Settings link.Give the account an appropriate name (this is particularly helpful if you have multiple accounts registered within Bria).You’ll now need your specific credentials information. Depending on your account’s specific setup, you may have received this information when you first signed up.If not, you can obtain this information by logging into our customer account interface and clicking either a) Home, My Extension (if you are a regular user) or Administration, Extensions (if you are an administrator). Find the extension for which you require credentials, and click “New Softphone Password” which is the lock icon to the right. Please note: this step will reset your credentials for any devices that are currently assigned to your extension. These devices may need to be restarted after you reset your credentials if they do not restart automatically.Once you have clicked New Softphone Password, a new page will open with your credentials. Please copy and paste these, and keep them somewhere safe, as you will need them for the following steps. Enter the password you generated above or received when you signed up. Note: this value has nothing to do with the password you use to log into our customer account interface and is entirely separate. 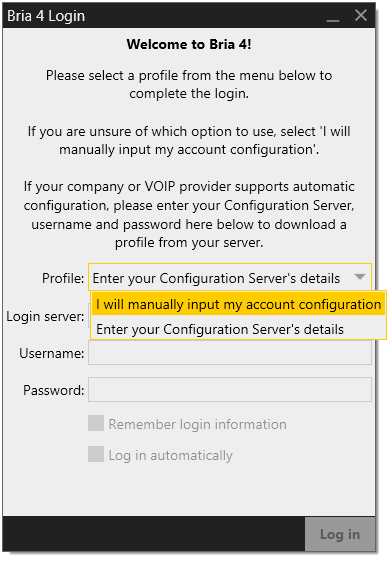 Now click on the ‘Voicemail’ tab to configure your voicemail settings. Ensure that the “Check for voicemail” box is checked (it should be by default).For Number to Dial for Checking Voicemail , enter *98 plus your extension number, with no spaces between characters (Example: Extension 225 would be *98225). Leave the other values unmodified. See below for illustrated example. 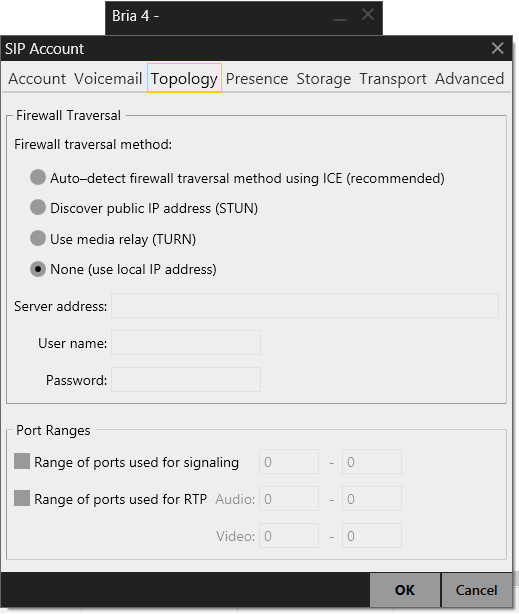 Change the Firewall Traversal method to “None (use local IP address)” and leave the other settings unmodified. Now click on the Advanced tab.These steps are critical for proper connectivity. Please be sure to complete them. 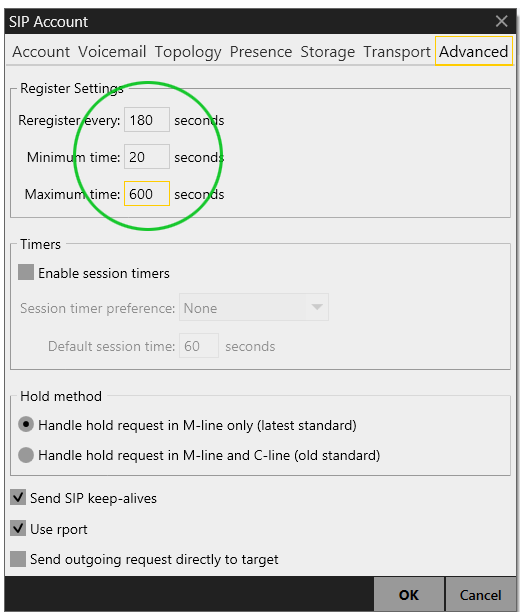 Maximum time: 600Leave the other settings unmodified, ensuring that “Send SIP keep-alives” and “Use rport” are checked (they should be by default). 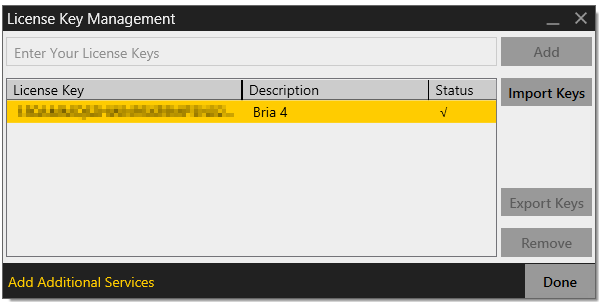 To place an outgoing call, simply click the “Enter name or number” field in the main Bria screen, and enter the phone or extension number you wish to call. You can use your keyboard or mouse to enter numbers. Then click the green telephone icon to the right of the number you’ve entered. When someone calls you a small window will appear, indicating the caller id information of the party calling you. To answer the call click on the green ‘Answer’ button. When you are on a call, the Bria application window will expand vertically to show you more options for your current call. To hang up the call, press the red telephone icon on the right side of the current call area.